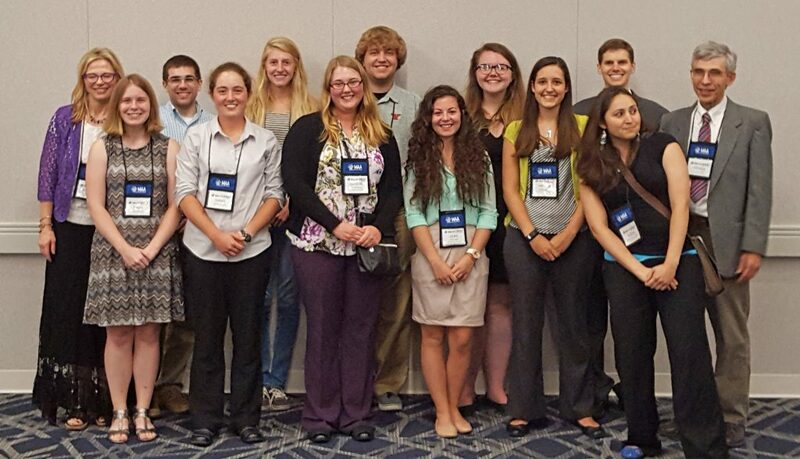 Participants at 2016 MathFest are, from the left, Angela Spalsbury, chair of the Department of Mathematics and Statistics, students Emily Hoopes, Sam Rakocy, Gabbie Van Scoy, Elise Eckman, Crystal Mackey, Zack While, Leah Bayer, Monica Busser, Natalie Halavick, and faculty members Tom Wakefield, Alicia Prieto Langarica and George Yates. Youngstown State University mathematics students continued their winning ways at MathFest 2016 in Columbus, earning two awards for excellence. Monica Busser of Hubbard, who presented research titled “Combinatorial Number Theory,” and Gabbie Van Scoy of Lisbon, whose research is titled :Math Models of Muscle Formation, earned awards of excellence in student exposition and research. Van Scoy received the SIAM award for best exposition or research in applied mathematics. This is the second consecutive year that Busser and Van Scoy have won awards at the national event. The YSU team has historically been one of the most successful at the annual event. YSU won its first award in 1989 and has won at least one award every year since, except in 1992 and 1994. YSU students won a record number of awards in 2013 with six. The team won five awards in 2005, 2006 and 2015. MathFest is the annual summer meeting of the Mathematical Association of America and Pi Mu Epsilon. In all, nine students represented YSU and seven gave oral presentations on their research projects. Leah Bayer of Brookfield, Ohio, and Elise Eckman of Poland, Ohio, also represented YSU. In addition, Bayer and Eckman, along with YSU student Zack While, were recently selected as CURM students for research projects at YSU through a grant under the direction of Prieto Langarica. Tom Wakefield, associate professor; Angela Spalsbury, professor and chair; Prieto Langarica; and George Yates, professor, attended MathFest with the students. Faculty who advised students included Wakefield; Prieto Langarica; Thomas Madsen, assistant professor; Eric Breimer from Siena College, Cynthia Flores from CSU Channel Islands; Bruce Landman and Abdollah Khodkar from Univ. of West Georgia.